“Keeping our fingers crossed, hoping for good hydrology” and waiting for the current and future interior secretaries to ignore the laws of the Colorado River that require protecting its reservoirs from depletion is not how to deal with this problem, she said. “It’s not how we’ve dealt with it in the past, and it’s not how Arizona wants to deal with it in the future,” said Burman, a longtime Arizonan who has worked for the Salt River Project utility and for former U.S. Sen. Jon Kyl of Arizona in the past. 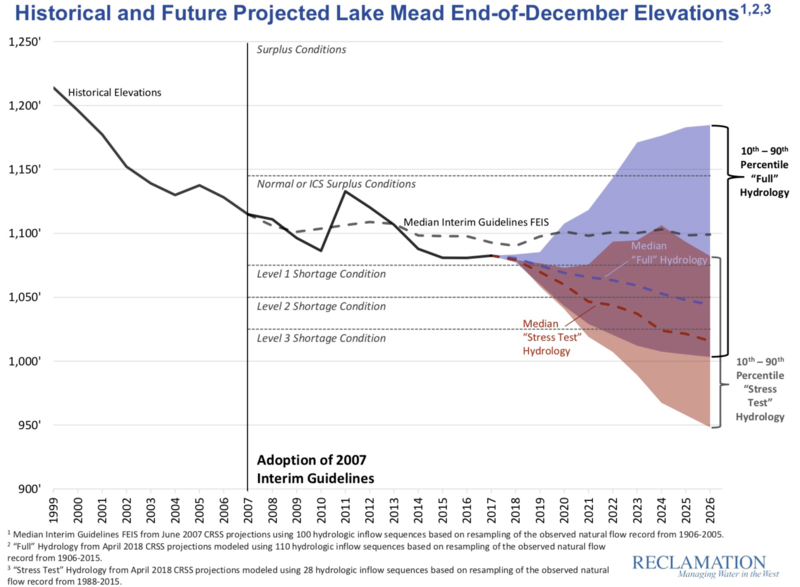 The bureau’s forecasts for how far and fast Lake Mead’s elevations could fall were most severe when the forecasters used what they called a “stress test.” It relies on computer models assuming a continuation of the last 30 years of unusually dry weather. Less severe risks of such declines were predicted when the bureau relied on the river’s entire historical record, covering 1906 to 2015, which included several much wetter spells, including the wettest period on record for the river, in the early 20th century. Based on the river’s entire historical record, there’s about a 65 percent chance of Lake Mead falling below 1,075 feet — the level at which the first shortage in river water available to the CAP would occur — by 2026. Using just the last 30 years of records as a base for forecasting, that risk grows to more than 80 to 90 percent, covering a period from 2020 to 2026. The risk of Mead dropping below 1,025 feet by 2026 is more than 40 percent using the bureau’s “stress test” forecasts, and about 30 percent when the forecasts rely on the river’s entire historical record. The risk of Mead being less than 1,000 feet high by 2026 is about 20 percent under the “stress test” forecast and less than 10 percent when the river’s entire historical record is used. The thought of Mead dropping below 1,025 or 1,000 feet is particularly alarming to many state water officials in Arizona and elsewhere. At those levels, U.S. interior Department intervention to manage the river’s reservoirs is certain. At that point, nobody knows what steps Interior would take to prop up the reservoirs, but it would almost certainly make drastic cuts in water deliveries to major cities such as Tucson and Phoenix that rely on the river for drinking water via the $4 billion Central Arizona Project. 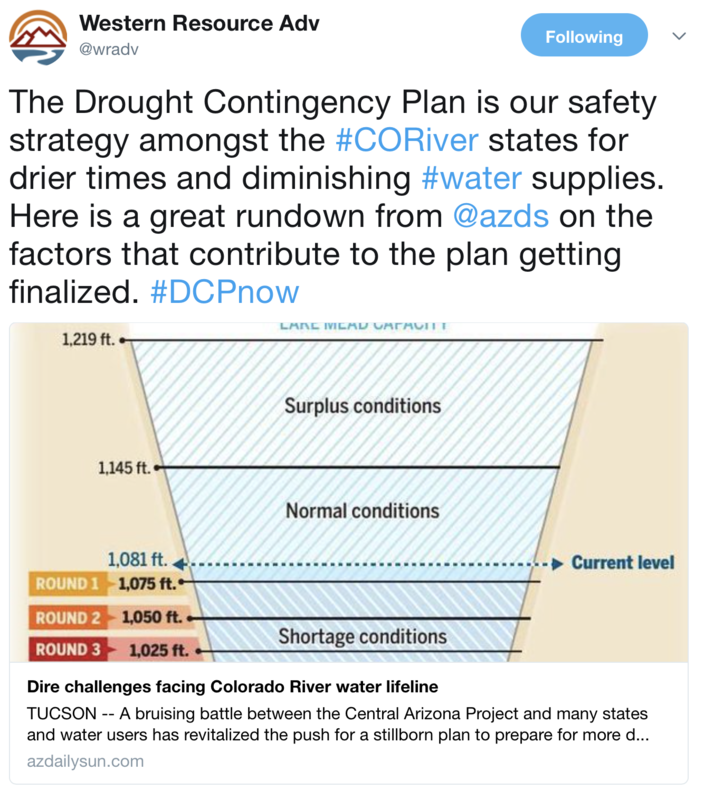 On the other hand, all these risks would drop dramatically if Arizona, Nevada and California agree on a drought plan to conserve up to 1.2 million acre feet a year of river water annually over time, bureau officials predicted. Many were using the #ColoradoRiver hash tag yesterday as well. State officials outlined their plans at a briefing in Tempe on Thursday with Brenda Burman, the commissioner of the U.S. Bureau of Reclamation, which oversees water operations on the Colorado. Much like her visit to California earlier this year, Burman stressed that the “time to act is now” for finishing and adopting a plan to store more water in Lake Mead in hopes of avoiding shortages on the river. Officials from other states echoed Burman’s call for quick action, urging Arizona to settle differences among water agencies and agree to a conservation plan that will benefit the entire river. Arizona Department of Water Resources Director Tom Buschatzke, Central Arizona Project General Manager Ted Cooke and Reclamation Lower Colorado Regional Director Terry Fulp also spoke in favor of finalizing a plan sooner rather than later. Officials stressed that such a plan likely won’t stave off all shortages — but they hope it will prevent more severe ones. While more Colorado River water is allocated to cities and agriculture than what has flowed into its reservoirs in recent years, intense drought and climate change exacerbate the disparity. Ultimately, if Arizona doesn’t pass a plan, the secretary of the Interior could step in. But that’s uncharted territory, Burman said, and it isn’t fully known what the secretary could or couldn’t do. 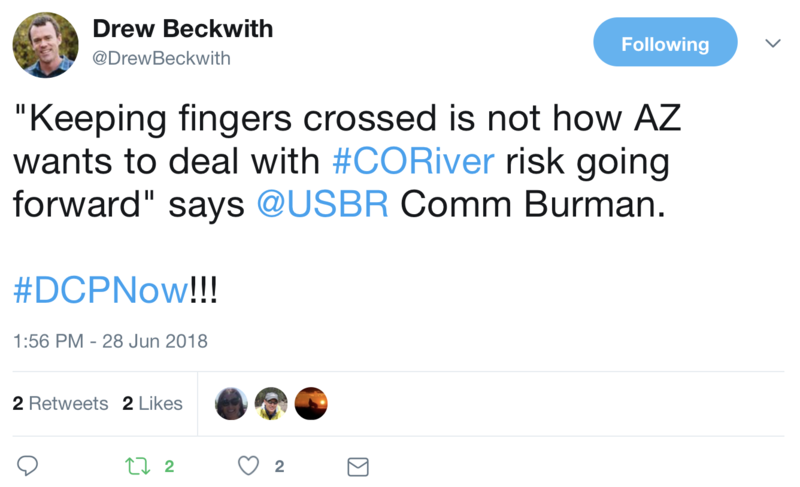 So the rest of the river users are banking on Arizona passing a plan before it gets to that point. He said the rest of the Colorado River states want Arizona officials to resolve their “internal issues” and finish a plan. Arizona officials say they are doing that by acting with urgency to get a plan in place before shortages come.